I imagine this is an odd time for musicians in New Orleans. They're coming down off the high of Mardi Gras but are about to gear up for Jazz Fest (which I am quite excited to attend this year.) So to keep the party going, the Kansas City-based band Ernest James Zydeco has taken residency in my stereo. The album was released late last year, and I regret that it's taken me this long to put it in your ears here. 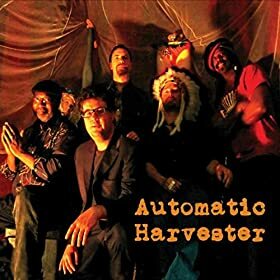 Automatic Harvester is a bombastic, high-octane cruise through the bayou music. First and foremost, James' band is a reminder that zydeco has a rich tradition outside of Louisiana. It features some of the finest talent in Kansas City, including my favorite fiddler, Betse Ellis. The band also bears a solemn tradition. As James tells it, his father, like many others, left the South for California in the 50s and 60s, which is where the tradition was passed on to him. If you close your eyes, you'll hear New Orleans, but if you listen close, you'll realize the songs are firmly rooted in Kansas City. More importantly, you'll find that these aren't party songs at all. "Automatic Harvester," the band's blistering statement of purpose, proclaims that the band can't stop partying, because that's what makes them alive. The final track, "Woah Bye," invites Death's cold hands to close over a life well-lived. But hey, don't worry about that right now. Throw back a Hurricane and get out there and dance.